Two men arrested after possibly trying to stage an unruly assembly with weapons. 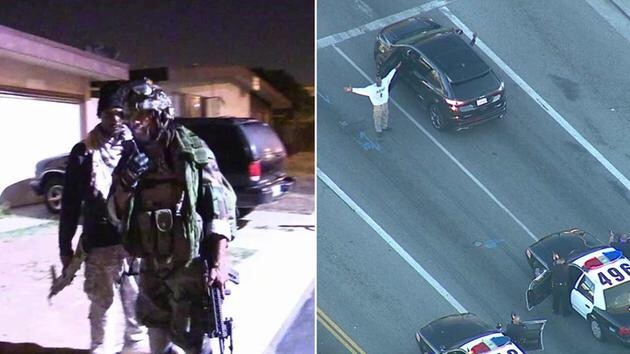 Inglewood, California: Two male suspects were taken into custody in Lake View Terrace Tuesday morning, authorities have reported, subsequently hours within the search as the suspects were walking surrounding neighborhoods in what the pair describe a “peaceful protest” whilst carrying rifles. The two men were initially located by the Inglewood police before 11 p.m., after a search was conducted in the area of 104th Street and Crenshaw Boulevard. Authorities monitored the two men, one of whom identified himself as “Tay S.,” both by helicopter and on ground, reportedly. The LAPD began following the pair after they went from Inglewood and headed northbound on the 405 freeway into San Fernando Valley. The suspects, early Tuesday morning, went to an apartment building near Stagg Street and Ventura Canyon Avenue in Panorama City. They later left the building in a vehicle and were followed by authorities to Lake View Terrace. When the vehicle actually came to a stop at Foothill Boulevard and Terra Bella Street, the suspects were taken into custody by police without incident.